Lately our days are filled with family fun outdoors, lazy days, and picnics with friends. 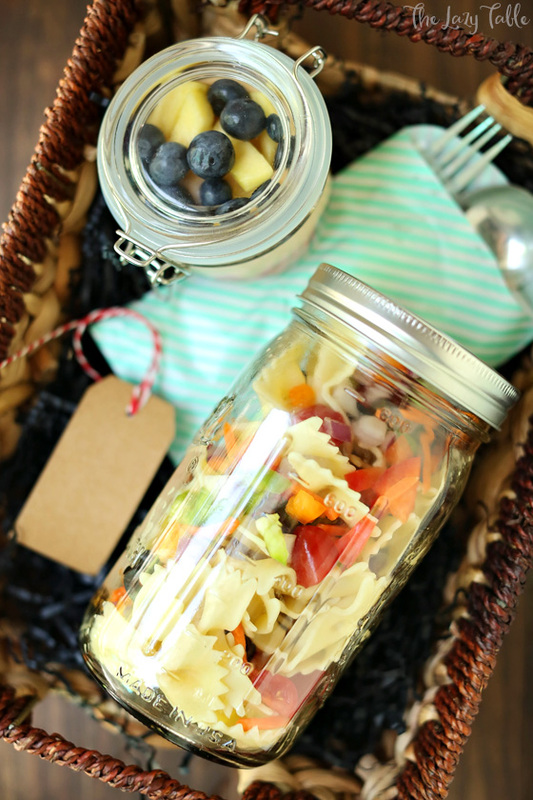 Eating on the go is something that we do a lot of when the sun comes out, but that doesn’t mean we have to sacrifice great food just for portability’s sake, so I created a quick pasta salad and fruit parfait in a jar that you are going to love bringing on your next picnic! 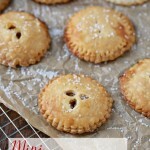 These are quick, simple, and perfect for carrying in your picnic basket on warm Summer days. They only take minutes to make too, so they are also a huge time saver. 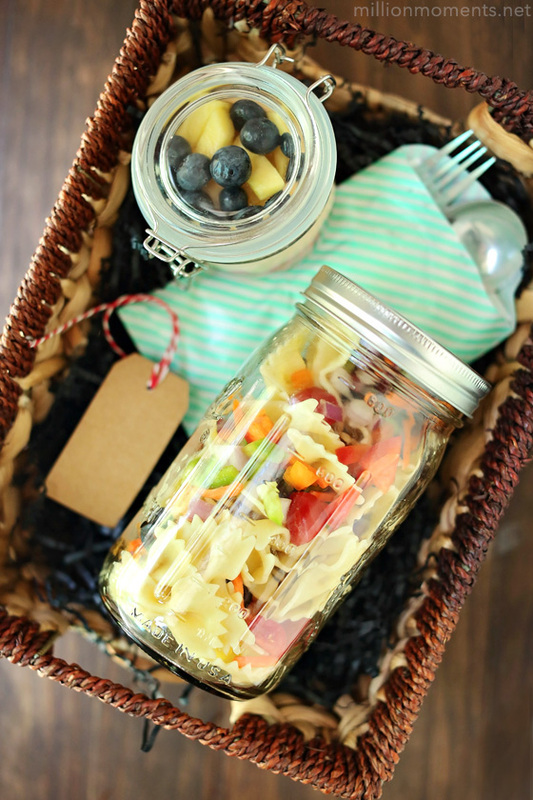 Both of these dishes are made in mason jars so they have the ultimate portability factor, but they are also great to use in a gift basket as well. 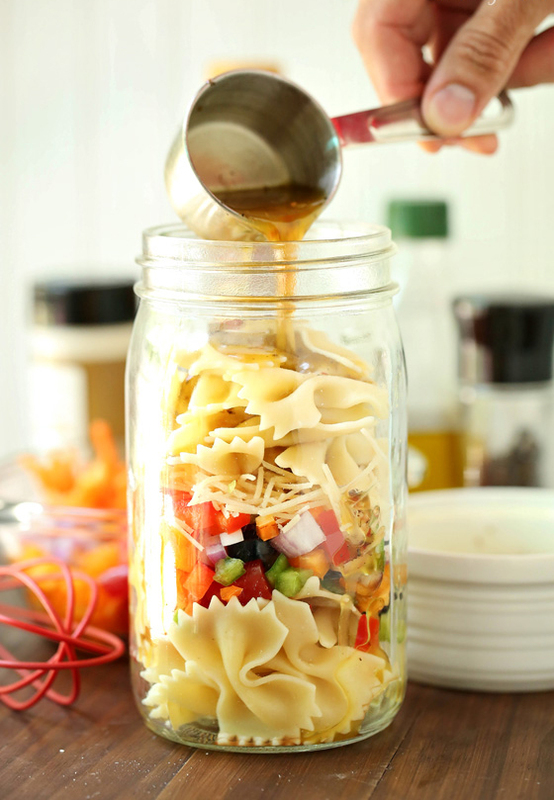 Each jar is a single serving, but with the pasta you can easily split it up if you wish. 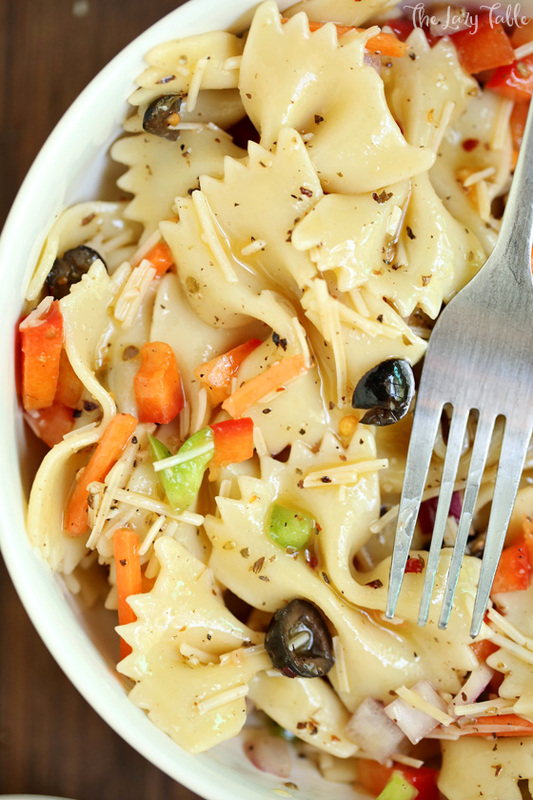 This pasta is one of my favorite quick meals to make. It features an oil/vinegar based dressing, and my favorite part about it is that the flavors mesh and marinate really well together as it sits! 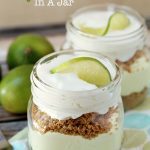 I am going to share the full recipe at the bottom of this post, so for now lets talk about what goes into it. 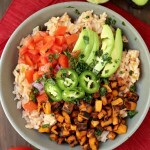 The beauty of this dish is that it is really customizable. You can use your favorite veggies, proteins, or even fruit and almost anything goes with the dressing. You can mix it up from time to time, and make more or less depending on what you need it for. 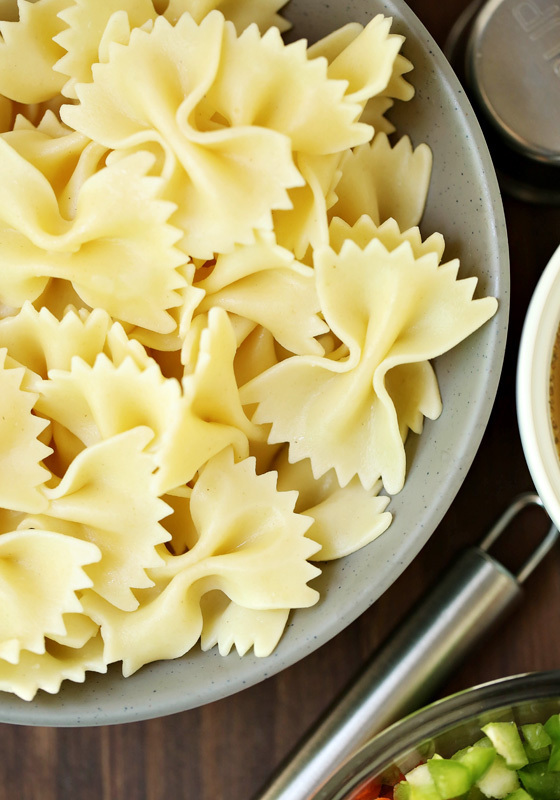 For the pasta itself I like to use bowties because they stand up well and the ridges hold onto sauce like others don’t. The real art of this recipe is in the ingredient balance. You want enough veggies and cheese that it is evenly distributed, but not so much that it matches the pasta, so I like to use a 2-to-1 ratio of pasta/veggies and then just a fourth cup of my homemade dressing. You can do it however you want, but I’ve found that less is more with a dish like this – it’s simple, clean, light, and really delicious! When you are ready to eat, just give it a shake and dig in! You can always pour it out into a bowl also, but for a picnic you can eat it right out of the jar. 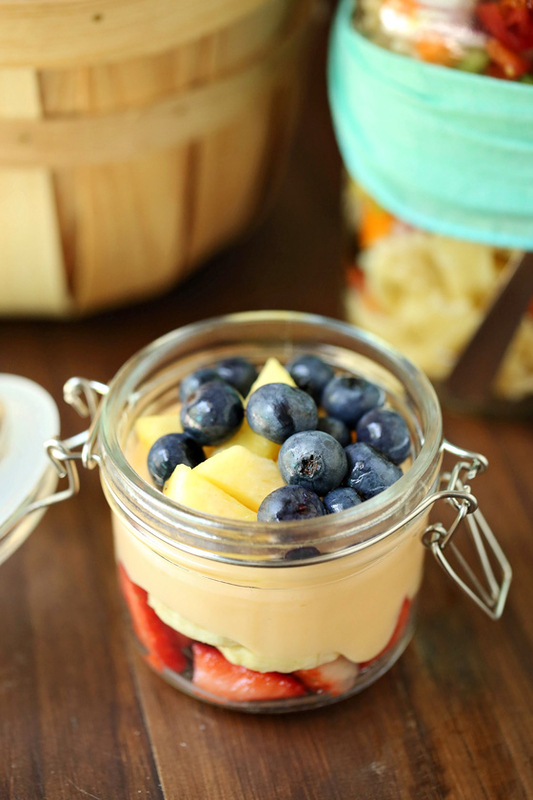 Now we can’t have a meal without a little dessert, so I also made an easy fruit parfait in a jar to go along with the pasta. For this all you do is cut up some strawberries, blueberries, pineapple, and banana and layer it in a small jar with 1/2 cup of peach yogurt. You can serve them both together or not, but together they make a great full meal. 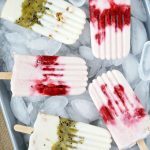 To take them on the go just pack them up with a fork, spoon, and napkin and you are good to go! 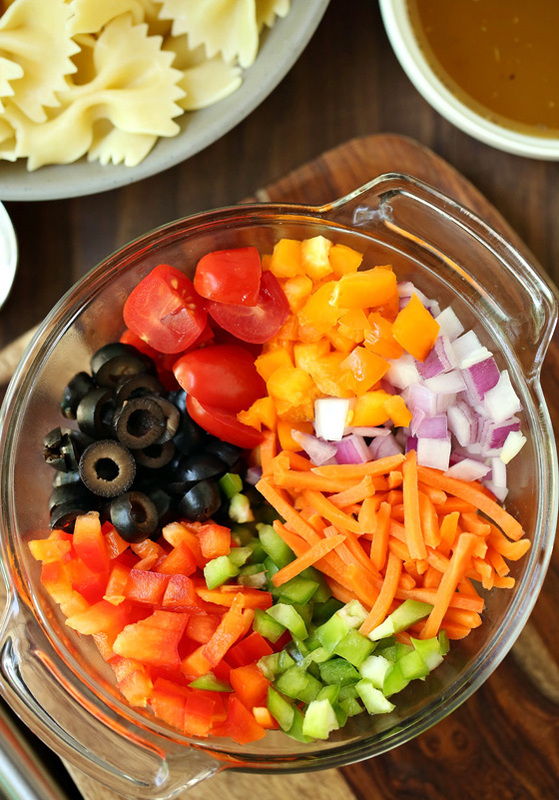 For the dressing, combine all ingredients and whisk until evenly blended. For the pasta, cook to al dente, then drain and rinse in cool water. 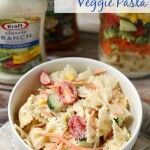 In a jar, layer half your pasta, followed by half your veggies, then repeat until your jar is full. Lastly, pour in your dressing to taste and you are ready to eat!